There are many incarnations of agyō and ungyō statues to be found around Ninna-ji. As I did not manage to get a shot of the other statue you’ll have to take my word on this, but the statue to the left is the closed mouth one of this pair inside of Kon-do. 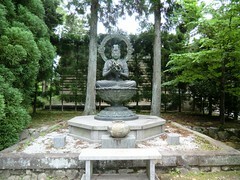 This statue is called Ryūtōki, the complementing statue is called Tentōki. In Kon-do they are both intended for use as candle stands though other versions carry lanterns rather than flat disks. While you will not be allowed to take pictures, if you would like to see the inside of Kon-do one of the guaranteed ways to be able to see inside is to stay at the temple overnight. 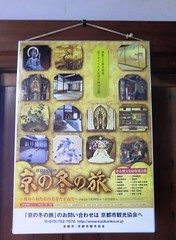 If you stay overnight at Ninna-ji you can attend morning prayers with the monks inside of Kon-do the next day. It is pretty impressive inside! I highly recommend taking a look if you have the chance! When you visit temples and shrines in Japan you will usually see statues in twos along either sides of pathways and within gates. If one statue has its mouth open and the other its mouth closed, you are looking at agyō (mouth open making the sound “ah”) and ungyō (mouth closed making the sound “un”) statues. At shrines you will often see animals such as foxes or lion-dogs (shishi or koma-inu), at temples Deva Kings are most common though there are lion-dogs at temples as well. 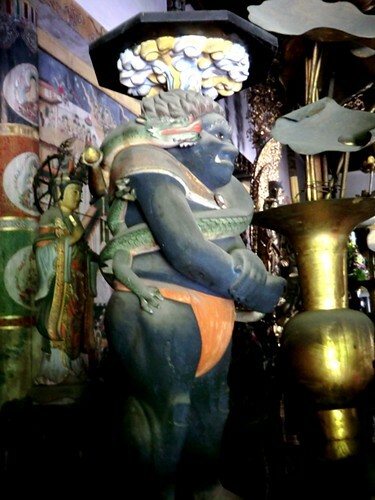 These statues are meant to protect the temple or shrine. There are several possible reasons behind the open and closed mouthes, you can read an explanation of some of the possible meanings here in this article on Niō Guardians. Below you can see the guardian statues that stand watch in Chū-mon. Now that we’ve gotten the introduction of agyō and ungyō statues taken care of, expect some posts introducing other versions of this pair from around Ninna-ji! 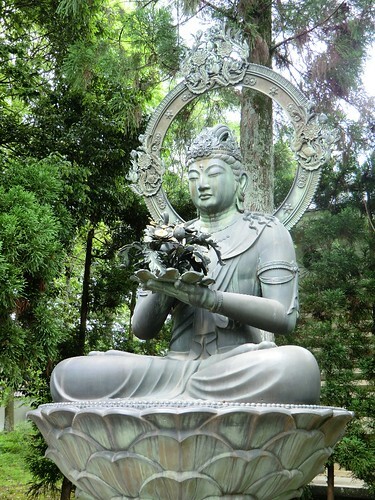 You can see this statue of Kongoke Bosatsu (金剛華菩薩), a bodhisattva associated with flowers, near the treasure hall (Reiho-kan). This statue was enshrined in 1981 at the ceremony marking 1050 years since the death of Emperor Uda. You can download both of these images in 1024×768 size at Flickr. Click these images for larger versions. Standing between Nio-mon and Kon-do, Chū-mon serves as the entryway to the heart of the temple grounds where the five-storied pagoda and Kannon-do are found. 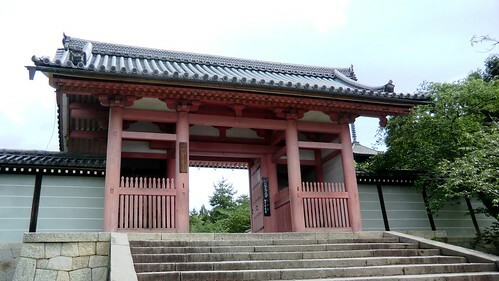 This gate was built during the reconstruction of the temple in the early 17th century. Compared to Nio-mon and Chokushi-mon, Chū-mon may seem relatively simple in design, but it is a prime example of early Edo period architecture. Fearsome statues can be seen on either side of the gate. On the left stands the Deva King Guardian of the West, and on the right the Deva King Guardian of the East.